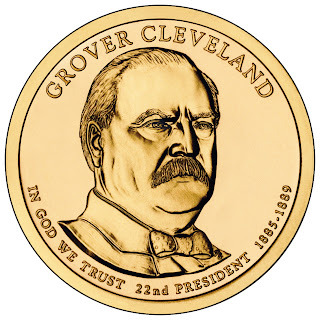 STEPHEN GROVER CLEVELAND was born March 18, 1837, the fifth of nine children to Richard Falley Cleveland and Ann Neal Cleveland. He was named after Stephen Grover, the previous minister of the church where his father was now pastor. In 1842, the family moved to Fayetteville, New York, a small farming community on the Erie Canal, where his father became pastor of the Presbyterian church. Young Cleveland attended the local school and at 13 attended the Clinton Liberal Institute in nearby Clinton, New York. His father died suddenly on October 1, 1853 and at 16 young Cleveland lost any hopes for college. His older brother William was a teacher at the New York Institute for the Blind and Cleveland was hired on as a teacher. In 1855, Cleveland left his teaching post. He decided to look for work in Cleveland Ohio as he wanted to be a lawyer and the west had always intrigued him. On his way, he stopped to visit his uncle, Lewis Allen a wealthy and nationally famous cattle breeder in Buffalo, New York. Allen convinced Cleveland to remain in Buffalo, gave him a job and by 1859 after studying law with friends of his uncle’s, Cleveland was admitted to the New York bar. He immediately offered a job with Rodgers, Bowen and Rodgers, which was where he had studied law, and he accepted. As the Civil War broke out, Cleveland was ever mindful of the support he provided for his mother and sisters. When he was drafted he borrowed money to hire a substitute to serve in his place, which was a common practice permitted under the law. In 1862, Cleveland was elected Democratic Supervisor of his Buffalo ward and in 1863, he was appointed assistant district attorney of Erie County. He crusaded against crime and corruption and made a name for himself. In 1870, Cleveland ran for Sheriff of Buffalo, and won the election and as Sheriff he continued his crusade against corruption. His term ended in 1873, and he returned to practicing law. He becomes one of Buffalo’s most successful attorneys, owing more to hard work than brilliant talent. In 1881, Cleveland was asked to run for mayor of Buffalo by the Democratic Party because of his work against corruption and he accepted. At forty-four, he was single and moderately wealthy and easily won the election and took office in 1882. Mayor Cleveland fought the city aldermen who were a corrupt circle of politicians from both parties. He vetoed bills in an attempt to cut the political graft that was rampant. He became know as the “veto mayor”. The party leaders of New York needed a new face in order to reconcile a deadlock for the nomination of a new Governor. Cleveland was chosen, and running on his reputation for being an honest politician, he won the election without making a single campaign speech. As Governor, Cleveland continued his campaign against corruption and he also continued to liberally apply his veto power. In 1884, the Republicans nominated James G. Blain, who had been accused of accepting bribes, for president. 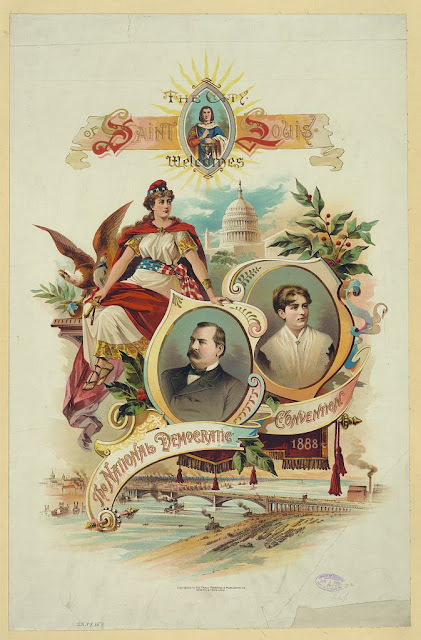 In July 1884, the Democrats nominated Cleveland for president, deciding that with his irrefutable public record, he would win the votes of both the democrats and the Republicans who were unhappy with their party’s choice for candidate. The campaign inspired many personal attacks, with Blain being accused of aiding the railroads at public expense and Cleveland being accused of fathering a illegitimate child, which Cleveland courageously acknowledged. Ten years before Cleveland's presidency, store clerk Maria Halpin named him as the father of her illegitimate son. Cleveland won the election by a slim margin over Blaine. The electoral votes were Cleveland 219 to Blaine’s 182. 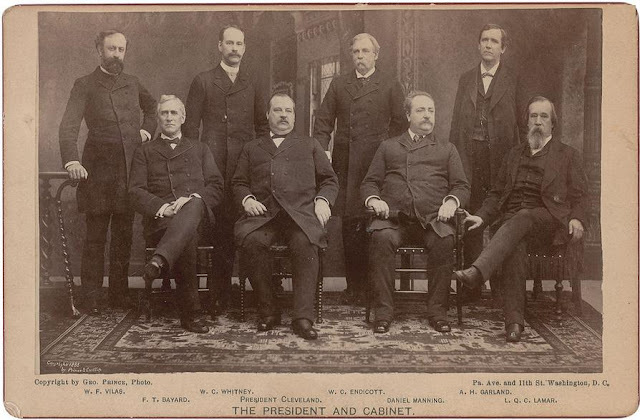 Cleveland was inaugurated March 4, 1885 and continued his independent and conscientious but conservative course. He continued to fill government posts with qualified people, not party loyalists and he persuaded Congress to repeal an act that kept incompetent officeholders in office because of the length of their service. He found himself continually at odds with the Republican controlled Senate. On June 2, 1886, 49-year-old Cleveland became the first and only president to be married in the White House. Cleveland's bride was his ward, Frances Folsom, the 22-year-old daughter of his late law partner and friend, Oscar Folsom. For years, Cleveland acted as executor of Folsom's estate, but no one suspected his interest in Frances until he proposed marriage after her graduation from Wells College. The wedding ceremony took place in the Blue Room with fewer than 40 people present. The couple had five children: Ruth Cleveland (1891-1904); Ester Cleveland (1893-1980); Marion Cleveland (1895-1977); Richard Folsom Cleveland (1897-1974) and Francis Grover Cleveland (1903-1995). In the election of 1888, Cleveland was running against Benjamin Harrison of Indiana. Although Cleveland received 100,000 more popular votes than Harrison, he lost the election in electoral votes receiving 168 against Harrison’s 233. Cleveland returned to New York City and resumed his law practice in 1889. However, three years later the Democrats once again nominated him. His Republican opponent was again Benjamin Harrison. Despite arguments within his own party, Cleveland decisively defeated President Harrison 277 electoral votes to 145. 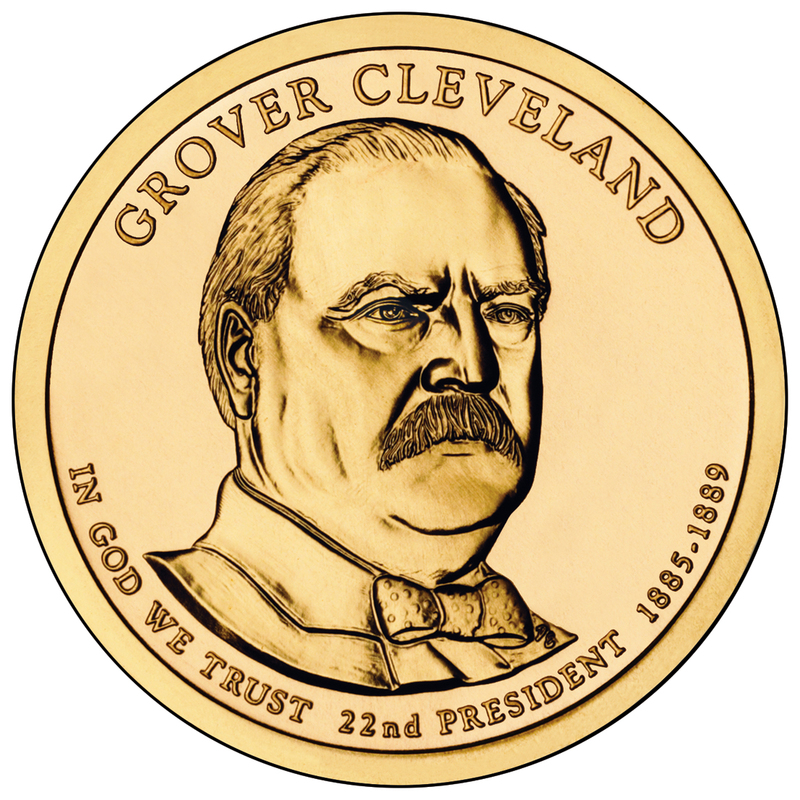 Cleveland became the only President to be reelected after defeat. On March 4, 1893, Cleveland once more took the presidential oath. The Depression of 1893 struck his administration hard. Some Democrats saw salvation in free coinage of silver, but Cleveland was able to persuade Congress to repeal the Sherman Silver Purchase Act in an effort to improve the economic situation. However, by focusing on monetary policy rather than on direct assistance to the needy, Cleveland lost the support of his party. The Democratic party was split by the end of Cleveland’s second term. 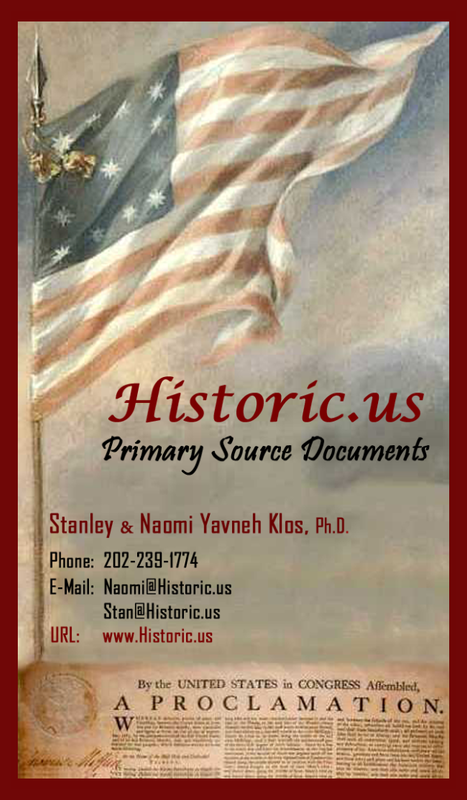 They had nominated both William Jennings Bryan and a rival candidate for president. Cleveland removed himself from the campaign and the Republican candidate, William McKinley easily defeated both Democratic nominees. On March 4, 1897, Cleveland turned the presidency over to McKinley and retired to a home he had purchased in Princeton, New Jersey. He remained a public figure, lecturing and writing and engaging in business affairs, most notably as a Trustee of the Equitable Life Assurance Society and as President of the Association of Life Insurance Presidents. He died in Princeton on June 24, 1908. 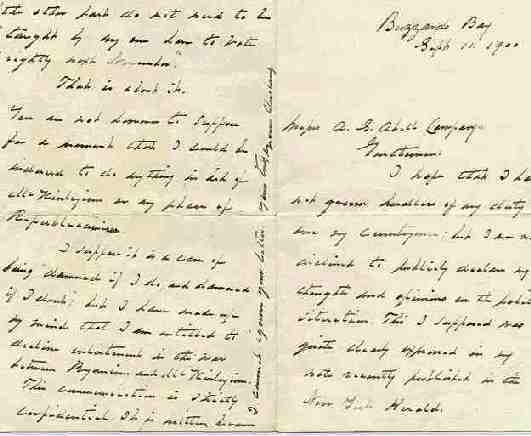 Grover Cleveland -- Autograph letter signed to A.S. Abell Company, signed “Grover Cleveland”. Four pages small 8vo - Pages 1 and 4 and Pages 2 & 3. I hope that I have not grown heedless of any duty I owe my countrymen; but I am not inclined to publicly declare my strengths and opinions in the political situation. This I supposed was quite clearly expressed in my note recently published in the New York Herald. For a number of years, I have been abused and ridiculed by professed democrats, because I have not hesitated to declare that Bryanism is not Democracy. I have had the consolation of seeing those who professed to share my belief run to cover, and of noting a more headlong rush after anti-democratic vagaries. My opinions have not changed. Why then should I speak when bedlam is at its height? Perhaps I am too strong in my opinions. At any rate I should say (?) things; and all to no purpose except to add to the volume of abuse which, undefended, I have so long borne. Think about it. 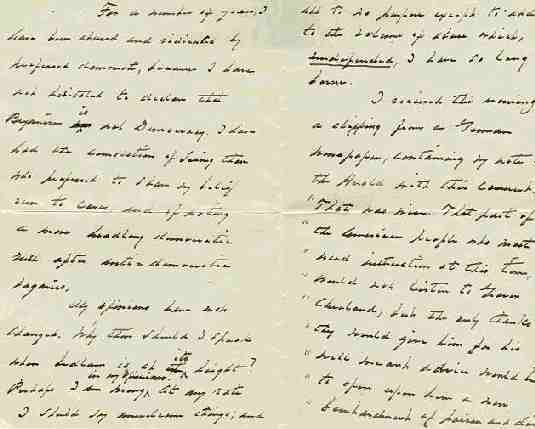 You are not however to suppose for a moment that I could be induced to do anything in aid of McKinleyism or any phase of Republicanism. I suppose it is a case of being “damned if I do, and damned if I don’t”; but I have made up my mind that I am entitled to decline enlistment in the war between Bryanism and McKinleyism. This communication is strictly confidential. It is written because I cannot ignore your letter.